Several eyewitnesses claim to have seen Indian military drones flying over Bolingbrook. Doug, another Bolingbrook who didn’t want to use his last name, clams that one of the Indian drones launched a mock attack against him. According to him, he was in the Jewel parking lot load his groceries, when a metal cylinder dropped from the sky. When he opened the cylinder, he found a note inside. Doug said that after a small crowd gathered around him, another cylinder dropped to the ground. This time, it had another note. Bolingbrook resident Melinda claims she was also targeted by Indian drones. 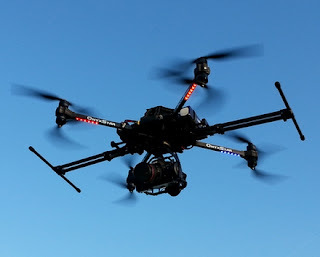 According to sources within Village Hall, India is flying drones over Bolingbrook to prose the proposed sister city agreement with Sialkot in Pakistan. The receptionist for Mayor Roger Claar denied that there was a deal in place, and doubted that Indian drones are flying over Bolingbrook. In the background, a man who sounded like Claar could be heard talking.